What is rhubarb? What is it used for? Although most people think rhubarb is a fruit, it's actually a vegetable, and one of only a handful of perennial vegetables on the planet. There are several varieties of rhubarb available. 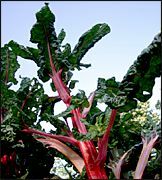 The most common type, rheum rhaponticum, is found in the U.S. Chinese rhubarb (rheum palmatum or da huang) is similar in appearance to the American version, but has a much stronger taste and a slightly different chemical composition. Rhubarb is an extremely hardy plant, and can grow in almost any environment. The plant's stalks are stiff and can grow up to three feet in length; each stalk is tipped with a large, textured, spade-shaped leaf. Rhubarb leaves are considered poisonous and should not be eaten. The root is used medicinally. Rhubarb root has a long history in traditional Chinese medicine; its uses were first documented in the Divine Husbandman's Classic of Materia medica, which was written approximately 2,200 years ago. Originally, herbalists used rhubarb as a laxative, and to evacuate the bowels and improve the digestive tract. Rhubarb has also been found useful in treating jaundice, endometriosis, and (topically) burns and skin ulcers. Furthermore, rhubarb has the ability to fight infectious fungi such as candida, and infections of the lungs and eyes. How much rhubarb should I take? As a decoction, herbalists recommend putting 1-1.5 teaspoons of pulverized, crushed rhubarb root in one cup of boiling water and letting the mixture for 10 minutes. The tea can be taken twice a day. Most herbal preparations of rhubarb, however, are individually prepared for each patient. Rhubarb may be combined with other herbs. What forms of rhubarb are available? Wild rhubarb still grows in various parts of the U.S. Dried rhubarb is available at nearly every Asian market or specialty health food store. Some stores also sell rhubarb extracts and tinctures. What can happen if I take too much rhubarb? Are there any interactions I should be aware of? What precautions should I take? Rhubarb should not be taken by children under the age of 12, or by women who are pregnant or nursing. It should also not be taken by patients with acute or chronic intestinal disorders, such as Crohn's disease. The most common side-effect noted with rhubarb is abdominal cramping; however, this condition is often relieved by reducing rhubarb dosage. Excessive use of rhubarb can lead to nausea, vomiting, diarrhea, and possible liver and kidney damage. Long-term use can lead to cirrhosis of the liver and hypokalemia (a metabolic imbalance characterized by low potassium levels in the blood). Due to a possible loss of potassium, rhubarb root should not be taken in combination with cardiac medications, diuretics or steroids. Loss of potassium can be decreased by combining rhubarb root with licorice root. As always, make sure to consult with a licensed, qualified health care professional before taking rhubarb or any other dietary supplement. Brinker F. Herb Contraindications and Drug Interactions, 3rd ed. Sandy, OR: Eclectic Medical Publishing, 2001. Blumenthal M, et al. The Complete German Commission E Monographs: Therapeutic Guide to Herbal Medicines. Austin, TX: American Botanical Council, 1998. Hoffman D, Quale L. The Complete Illustrated Herbal: A Safe and Practical Guide to Making and Using Herbal Remedies. New York: Barnes and Noble Publishing, 1999. Marty AT. Herbal medicines. JAMA 1999;281:1852-3.